A new "experimental" game-oriented theme park has been announced, but not much else has been revealed. One of the biggest challenges for a theme park is finding a theme that has a mass amount of appeal. A group has announced that it is planning to start up such a resort based around videogames, though details like what types of games and where the park is going to be located have yet to be revealed. You stand in line with your family -your friends- your clan. You're among many. Talks of strategies, goals and notoriety are all around you. What stands before you is a towering entrance, which calls to all and challenges your inner warrior. You know behind these walls there awaits a world filled with myths, legends, and arenas all crying out for their champion. As you pass through the gates, you leave behind all worldly stereotypes. You're now one of millions, all equal, separated only by your skill, wit, and achievements, which will be proven. Your experience points and score are recognized by the guardians of this domain. As players walk by, recruits are saluted and veterans are bowed to. You are guided to the armory where you must select your weapon. You choose from majestic relics, whimsical hardware or advanced gear. Here your dreams and fantasies will come to life in adventures yet to be told. You will become anything you like and live out the character you create. But this is no game. It's real. 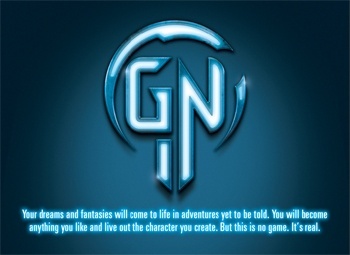 Welcome to Game Nation! It turns out the park is the brainchild of Daniel Ruke, owner and founder of the creative agency known as Blink. Information like who is funding the park, and whether or not it will be anything more than some kind of high-tech version of a live action role-playing game have yet to be revealed. However, "in the next 12 weeks," a decision for the park's location will be made. GamePolitics was able to talk to Ruke and learn a little more about the planned resort, but not much more, though themes will include, "warfare, spacecraft and dragons, complete with 'battle arenas.'" According to GamePolitics, Ruke also plans for the park to appeal to as many people as possible with areas that will be completely family-friendly and sections that are aimed at mature audiences, where "you are gonna see headshots."